I went to Hobby Lobby today while running errands to see if they had any containers that would be just right for the Splish Splash Duck Soaps. 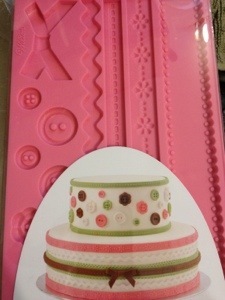 Although I didn’t find anything for that I found some really cute fondant molds. I’ve been eyeing what the wholesaler calls “Deco It” molds. Basically they’re molds with several detailed and shallow patterns. You pour colored soap into the details and when they’re unmolded you “glue” them (with a little soap and alcohol) onto the surface of your main piece of soap, making it quite impressive. You can make a simple square soap into a package, scatter flowers all about, or put a fancy little border around your soap. I’ve been itching to try this since they came out on one of my wholesaler’s sites, but couldn’t justify the cost. While looking at the fondant tools (you’d be amazed how many things can be repurposed for soap) I saw their fondant molds and realized that the “Deco It” molds are really just these fondant molds. *grin* Plus, they’re a bit cheaper, too. *small happy dance* I had a really hard time deciding, but even Larry liked this one, so I got a really cute mold. The trim could be really cute across the top of a bar or along the border of a guest round, while I think soap buttons would be one of the cutest additions for a kid’s soap. Larry thinks the bow might be neat as an embedded soap, too. I’m so anxious to try these decorations out. I hope I have some examples to share soon, but couldn’t resist showing you. I hope you have a great night and a happy Wednesday!